Julius Rudel Interview with Bruce Duffie . . . . . . 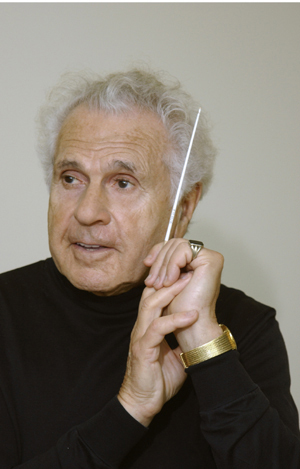 When one hears the name of Julius Rudel, one immediately thinks of the New York City Opera, for much of his highly successful career has centered around that company. Rudel was born in Vienna in 1921 and studied at the Vienna Academy of Music. He emigrated to the United States in 1938 and continued his musical studies at the Mannes College in New York. He joined the staff of the New York City Opera in 1943 as a rehearsal pianist and made his conducting debut with the company later that year. He was named Musical Director in 1957 and the rest, as they say, is history. During his long association with it, the company became a very important house, producing many interesting and varied works, and introducing and developing singers. Many of the artists went on to international careers, the best-known being a quartet comprised of Beverly Sills, Placido Domingo, Sherrill Milnes, and Norman Treigle. Now, Miss Sills has inherited the mantle of Mr. Rudel – at least in the administrative offices of the New York State Theater at Lincoln Center. 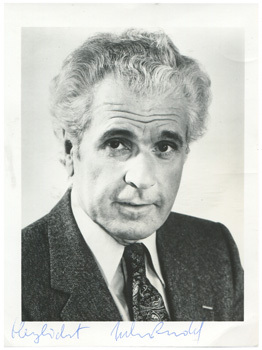 In addition to his many responsibilities at the NYCO, Julius Rudel found time to conduct and be administrator of many other musical organizations. Besides conducting opera companies and orchestras, he has been the Musical Director of the Caramoor Festival, Musical Advisor for Wolf Trap, and Music Director for the first four seasons of the Kennedy Center in Washington, D.C. He has also garnered honors and titles and reviews which speak of the diversity of his chosen repertoire, his devotion to giving New York an “Ensemble Opera,” and performances which are never dull. 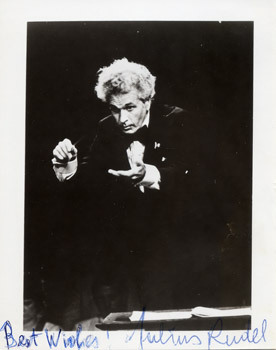 In this day and age, achievement is often judged by the recorded legacy, and Julius Rudel has conducted several outstanding recordings including complete editions of Handel’s Julius Caesar with Sills and Treigle, Boito’s Mefistofele with Treigle, Caballé, and Domingo, and Louise with Sills, Gedda, and Van Dam. Of particular interest to members of the Massenet Society are his recordings of Manon with Sills, Gedda, Souzay, and Bacquier, Thaïs with Moffo, Bacquier, Carreras, and Diaz, and Cendrillon with von Stade, Welting, and Gedda. Last fall in Chicago, Rudel prepared and conducted two productions – Tosca with two different stellar casts – Bumbry/Marton, Domingo/Luchetti, Wixell/Nimsgern, directed by Tito Gobbi, and Mozart’s Così Fan Tutte which he conducted from the harpsichord in a production directed by Graziella Sciutti. Between rehearsals and performances in Chicago, he was flying back and forth to Buffalo for duties there with the Philharmonic. Despite this impossibly hectic schedule, the Maestro agreed to take a few minutes before a performance to chat with me about matters operatic. Far from being tired and wan, he was bright and bubbly and completely alive to all that was going on. Sitting in his dressing room, we chatted about many things, and here is some of what was said…..
Bruce Duffie: Let me first ask you a perhaps indelicate question – do you like not being the director of the New York City Opera? Julius Rudel: I love it, and that’s not indelicate at all. BD: I assume that you did like it when you were doing it. JR: [Wistfully] I did. It was a challenge and I enjoyed the opportunities to do certain things with some ideas I had, and to discover some people and work with them. But after all, I was there for 22 years and that’s a long time. It turned into a real burden because the administration got more and more demanding and left less and less time for music. So I finally decided I’d had enough of that. BD: So you’re glad to be free of administrative decisions? BD: How much do the financial and economic problems enter into decisions that are made away from the manager’s office? JR: In a sense those problems enter into every decision. You live in a real world and others decide what can be done and how far you can go and what you can hope to cover. You have to be aware of that whether you are the manager or not. BD: Do you have more compassion for those who make the decisions? JR: I certainly do. Only when you’ve done it do you really realize how complex it is and how many conflicting demands are on the specific resources. BD: Is being a general manager of any opera house becoming an impossible task? JR: I don’t know. It’s the nature of the thing to always have more limitations. It’s still manageable and some of it’s done very well I think. BD: Do you enjoy the works of Massenet? JR: Yes I do – particularly the ones I’ve conducted. He was a consummate man of the theater – most skillful and often inspired, but even when not inspired, at least most professional. BD: That’s not to say merely workmanlike composition, is it? JR: Oh no, I’d never say that at all. He’s uncanny in the specific limitations he set for himself in any given scene or expressive place. He can make do with the most limited means and bring them off extremely well. It’s more than skill, it’s an uncanny sense of what’s required. BD: Is Massenet an under-rated composer? JR: Probably in the German-speaking countries he is, as Verdi was for a long time and as Puccini is still to some extent. JR: I suppose so – I should hope so. I hope all music is entertainment at its most exalted. JR: I don’t think there need to be any conflict between art and entertainment at all. BD: Are they two different things? JR: I don’t know that they are. Mozart had no intentions of writing “Art” – he wrote entertainment. It turned out sublime, but he had no idea that it would make lots of people rich 200 years after he died a pauper. BD: Are composers today too concerned with their places in history? JR: I think so, yes. It’s sort of become that everyone is jockeying for position. That’s an exaggeration, but there is an awareness nowadays. You have the examples of so many from Monteverdi onward who have left an indelible mark over the centuries, and it hangs heavy over someone who creates now. BD: They wrote for a specific production and were pleased if it was revived another year. JR: Oh they were most happy if they could interest someone in reviving it, and offered to change things around to suit the new production. They changed things considerably from one time to the next, and I find it astonishing today that the purists are riding herd over the slightest changes. They even try to resurrect everything that the composer might have thrown into the wastebasket. Items become essential because the composer wrote them, even though he himself may have discarded them. There is a great danger in overlooking the fact that composers – even Wagner who certainly cannot be considered to have been particularly modest – were willing to live within the limitations of a particular situation. BD: Is there any point to going back to original or altered versions of operas? JR: Oh it’s interesting and certainly it’s good to have the knowledge of exactly what was written. Then you can determine for yourself what was cut and why. BD: Do you, then, over-rule the composer? BD: Do you ever get any divine inspiration when you’re conducting? JR: Sometimes you do feel it elates you to the point that you’re in Heaven, but that is what genius does to you. I don’t know that it’s a specific revelation at that moment, but sometimes you feel that a phrase has gone particularly well, or an act hangs together really beautifully. After all, we’re re-creating every time, and sometimes by itself it turns out exceptionally well. Other times, some little thing is missing and you try to make up for it here and there. BD: Do you consider Massenet a genius? JR: I think we must be very, very sparse in calling someone a genius. We can find a few but one needs to be a little but careful with that term. It should be reserved for the extraordinary. BD: Can I nudge a few names out of you for a list? JR: Mozart of course. I would imagine Beethoven. Perhaps Bach. BD: Would you include Berg? JR: He certainly is very high on the list. He is the one man who made the atonal school work, and that’s a great achievement. I am very much moved by most of his music, but when you compare the incredible wealth of the output of Mozart and the incredible level of most of it, and the variety of means – the man was a master in so many forms – that’s genius. BD: Is that what puts Massenet at a little lower level – that he had a spark of genius occasionally but the rest is just a little less? JR: Well, yes, if you like to classify it that way. BD: Am I wrong to try and pigeon-hole him? JR: I think so. Why worry about it? We derive a great deal of pleasure from Massenet as we do from a number of others. We worry ourselves as to where exactly they fit in. It doesn’t hurt to have an idea of the background and the circumstances of a composer’s output and his life, but I don’t think it should in any sense influence us. Just because someone has a hard life is no reason to like his music more. BD: Should we try to find something to enjoy even in poor composers? JR: Well, there but for the grace of God go I. I started out to be a composer, but when I was 19 I decided that the world had enough bad composers and I stopped composing. I think that a lot of others have probably done the same thing. BD: Should we listen to the music of bad composers? JR: If you derive any satisfaction from it. If it fits your mood or if you’re curious, yes. Sometimes you learn something from a negative source. You can also learn something from a bad singer or a bad conductor. BD: That’s one of my own hobby-horses – to get more works presented. Do you feel there are too few works represented in the “standard” repertoire? JR: Yes, but you can’t fight it. You can try to guide audiences to enlarge their horizons, and occasionally you will succeed. But right now, it’s the “Golden Dozen” and that’s it. BD: Does it come down to a matter of taste? JR: Taste is always important in the whole process of entertainment. BD: How can we get the public to respond to the lesser-known works of Massenet? JR: I don’t really know. We cannot ignore history, and a lot of things have happened since these works were first done. Unfortunately, some of the music which seemed perfectly fresh and genuine then (because it was easily assimilated) has been used by the media as underscoring. So the freshness is gone and now it sounds a little like what we’ve heard a lot of when we go the movies. BD: When considering taste, should the opera house be a leader or a follower of fashion? JR: Probably the astute director is both. To believe in something and push it is fine, but if there is a discernible trend he should try to ride with it. You have to have a certain nose for it and hope that it works. If you cast a work well and it goes well, you have a “hit” on your hands. BD: How much can you push any particular opera if you don’t have an ideal cast? JR: There are so very many ingredients – you measure them out and see. If you have a strong lead, it can sometimes make up for a less-strong department somewhere else. I suppose it’s an equation, and it’s even greater if all the elements are great. BD: Have you ever achieved perfection? JR: Sometimes you have the feeling that you’ll never again equal something that you’re doing, but you can’t stop living. You have to go on and try to live up to it – or even be a little bit better. There is always something that you can improve. BD: We seem to be in the age of the stage-director. Are they getting too much power? JR: These poor guys have to re-do an opera and bring something to it. In most cases, the composer has left pretty explicit instructions, so what can the stage-director do? The conductor can always go right back to the score and discover or re-discover things. For the stage-director there is a limitation, so out of that desperation – and a certain egoism I would say – grew a breed of directors. Some try to go with a “sub-text,” and there is something to that if the music is not violated. It’s fine to find something new that has not been stressed before, or to find new angles. It’s also fine to take a step backward. There are certain things that are indicated in the score which are simply not acceptable today, so adjustments have to be made. The more skillful and more imaginative the director is, the better he can do these things. BD: What about productions that are way out in left field? JR: That all depends on how genuine the producer is, and how intent he is on making a big scandal. There are such, particularly in European houses where the repertory goes on and on and on, and they search for notoriety. Some houses will engage a director who announces proudly that he has never seen the particular work, and doesn’t intend to before staging it. BD: Is it a good thing for singers and conductors to know operas from other performances? JR: I suppose it is. You can’t un-hear or un-see something. We can hope that the artists have enough intelligence, integrity, and interest to form their own conclusions. And sometimes you are able to pick up a great idea. BD: Do you steal ideas from other people? JR: I don’t know that I steal, but there are certainly many things that are commonly known. I do know one stage-director who gets many requests to borrow an idea or bit of business. He usually says yes. BD: What should be the role of recordings in society? JR: Two fold... First, the preservation of a certain artist’s interpretation – putting it on the record as it were – and second for the large public that doesn’t have the opportunity to go to the live performance, and must make do. BD: When you’re conducting, do you feel you’re competing against recordings – even your own? JR: I’ve never thought about that. We all die a thousand deaths, and opera has more than its share of possibilities of things going wrong. BD: Do audiences expect the same perfection in the theater as they have on their discs? JR: Yes, but even though a performance may not be letter-perfect, it may have many other aspects that more than make up for it. BD: What is the role of television – should opera be on the tube? JR: Why not? There’s so much junk on, why not something good? There are two ways of going about it – you can simply repertorially transmit a given performance from a given house to the air and the audience at home becomes an enlargement of the audience that’s in the house, or you can create and produce specifically for the different medium. Each method has its advantages and also its drawbacks. BD: How are voices different today from when you first started conducting? JR: I don’t know that they are. In one sense, the preparation now in this country is remarkably good and fairly full – including opportunities to actually perform within certain givens. There is less need to go to Europe, but years ago American artists were happily accepted there. Now there is a new generation of European singers so they have first call on the opportunities. BD: Is there enough opera being done in America? JR: From my point of view, it will never be enough, so perhaps I’m slightly prejudiced. JR: Yes, I’m optimistic about it, but I’m basically an optimist. Opera is here to stay and has proven its relevance to a large enough number of people to show that it has a right to exist. Bruce Duffie is an announcer with WNIB “Classical 97” in Chicago, and editor of the monthly magazine OPERA SCENE. He has also given lectures for Lyric Opera of Chicago, and contributes regularly to the Massenet Society as well as the Wagner Society of America. This interview was recorded in a dressing room of the Civic Opera House in Chicago on November 1, 1982. It was transcribed and published in The Massenet Newsletter in July, 1983. Portions were also used (with recordings) on WNIB in 1989, 1991, 1993 and 1996. The transcription was slightly re-edited, photos and links were added, and it was posted on this website in 2012.